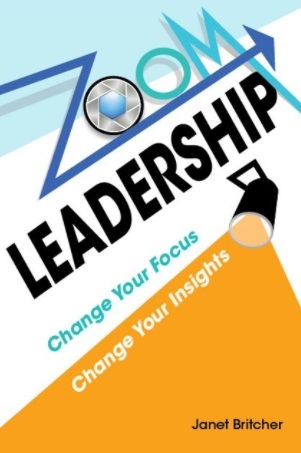 Janet Britcher, author of Zoom Leadership: Change Your Focus, Change Your Insights, is president of Transformation Management, an organizational transformation and effectiveness consultancy. 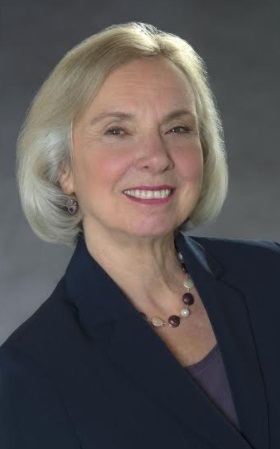 Janet has extensive leadership, executive coaching, human resources and organizational consulting experience, as well as serving as adjunct faculty in management at Lesley University and Regis College. She is a coach supervisor for William James College Executive Coaching program, a coach with the Executive Education program at the MIT Sloan School of Management, and is a certified coach through the International Coach Federation. A resident of Boston, Massachusetts, Janet brings an intuitive, spiritual and mission-driven passion to her work. Synthesize – I make meaning out of bits of information, intuition and conversation. I see the big pattern in contradictory paradoxical situations. How do I do this? I alternate between regarding a situation as if from the balcony, and then listening to the deeper meaning of words, up close. I zoom in and out. I am always learning and I love what I do. I love finding out a new approach to understanding challenges, conflicts, puzzles or disconnects. If a situation baffles me, that’s motivation enough for me to find a new perspective. That’s what inspired me to write my book Zoom Leadership: Change Your Focus, Change Your Insights. Just as I need new points of view, in my leadership coaching, my clients also need the benefit of a new perspective. My mission is for all leaders to be supported and successful in their role. That will result in employees being engaged and productive, creating successful companies. The best part: people bring that energy and satisfaction home to families and communities. It all makes the world a better place. Learning to stand my ground as an invitation not a confrontation. As an executive coach I am called on to help clients get clear on their dilemmas, options and core values. They also seek input from me, and most of them welcome a tactful challenge – even about their own contradictions. When I have an opinion I want to share that I think would be helpful, offer it in a way that is respectful of the client’s agenda and goals. It is the same skill my executive clients need when influencing up. Advocating as an invitation not a confrontation. Deciding to start my own business. I loved my last corporate human resources job and hoped to replicate being part of a similar executive team when I left 15 years ago. As I considered those opportunities, I realized what I felt most passionate about was leadership development, and I had the expertise to make that a reality. It helped that my prior colleagues brought me in for my leadership coaching services in companies as they moved around. As with any new business the first years were a rocky road, but I felt committed and determined and the results have been gratifying. “I don’t know, but I can find out.” This is an extremely empowering view of the world as it gets more complicated and fast paced. I don’t have to know everything, but having the confidence to admit what I don’t know, and the commitment to learn, sustains me. I love a triumph-against-the odds story. David and Goliath. The Kings’ Speech tells of King George who had a debilitating stutter all his life, and worked to overcome it and give compelling speeches when radio was a new form of communication. Naturally when my clients achieve a goal, developing a competency or receiving a promotion, I get that same thrill. For example, Daniels’ boss hesitated to promote him until he established more reliable information about progress and challenges. She never knew where things stood, and couldn’t accurately report to her managers. Once he integrated that approach and communication into his one-on-one meetings he was promoted. I love the city I’m in, Boston. It was a Goldilocks choice: I grew up in New York (too big), and then the second half of my childhood in Hartford, CT (too small). Boston is just right. For travel destinations I relish the many and varied Caribbean Islands. In Europe, Paris and the vineyards of Bordeaux top my list. For downtime, I make jewelry, getting lost in the colors and textures, tuning in to my creative side which has no rules or deadlines. Creativity soothes my soul. Music inspires me as well. I especially enjoy acapella and chamber music. It may seem curious to name meditation as a passion – it’s so quiet and contemplative, and passion is often thought of as outspoken and even noisy. Here’s why it’s my passion: when we’re quiet, we can listen to ourselves. The most powerful resource is alignment with ourselves, which can only happen when we know what’s going on inside, beneath the surface. That’s where integrity resides – integrating competing contradictory parts of ourselves until we can claim our stance as our own.